From postcards that respond to the politics, to posters suggesting vacations on Mars, here's a look at some of the best graphic design and illustration projects of 2017, selected by editorial assistant Gunseli Yalcinkaya. This year saw London-based designers Nathan Smith and Sam T Smith release a book filled with postcards that respond to Brexit. Containing over 100 designs, the postcards feature an illustration of a "shocked" London Eye and a parody of horror film The Shining, adapted to feature then-UKIP leader Nigel Farage. The book was dispatched to European studios and artists on the day that the Article 50 withdrawal process was triggered, to encourage collaborations post-Brexit. Studio Moross' posters for the newly reopened Dreamland in Margate celebrate the former glory of the historic UK fairground. Through the use of kooky illustrations, lively colours and inventive wordplay, the posters have a vintage feel that is reminiscent of music festivals. Wieden+Kennedy Amsterdam created a positive message for change in 2017, by transforming the Royal Dutch Football Association's lion logo into a roaring lioness, to represents the national women's squad. Intended to inspire women in the Netherlands, and around the world, to take up football, the logo is described as "a symbol of power, strength, elegance and agility". Leading with the tagline, "finding women shouldn't be this hard", this campaign for UN Women in Egypt, by illustrators IC4Design and marketing agency DDB, was designed to draw attention to the lack of women in the Egyptian workforce, which is only 23 per cent female. The illustration offered a novel approach to tackling the all-too-real problem of gender inequality in the workspace. Filmmaker David Lynch created this trio of craft beers, inspired by his cult television series Twin Peaks. Each of the three beers is represented by a different metallic colour: gold for Log Lady Lager, in reference to Margaret Lanterman's "Log Lady" character and her clairvoyant piece of wood, red for Red Room Ale and bronze for Damn Good Coffee Stout. The newest addition to NASA's collection of posters advertising other worlds as vacation spots is a design featuring planet TRAPPIST-1e. The poster features a retro vision of two passengers looking out of a window at a red and blue citadel, aligned by orbiting moons. Yayoi Kusama: From Here to Infinity! is a book documenting the life and work of the prolific Japanese artist. Featuring playful illustrations, made using gouache paintings that were assembled digitally, it helps children to learn about Kusama's journey to success. American rock band The National's album art for record Sleep Well Beast has recently been nominated for a Grammy for best packaging. 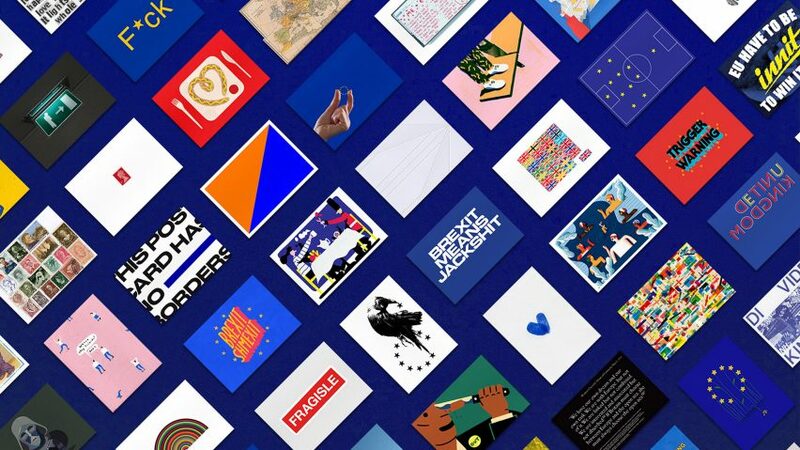 Designed in collaboration with Pentagram's Luke Hayman, the album enjoys an expansive merchandise collection – ranging from T-shirts to staplers and tape dispensers. Inspired by the "retro, slightly monotonous" identity of 1970s corporate branding, the record design is a playful nod at political propaganda, especially in lieu of Donald Trump's election. London-based illustrator Rob Flowers' series of edible posters for an exhibition aimed at encouraging children to experiment with their food offers an example of how graphic design can be used in innovative ways. The six posters were inspired by "ultimate food fantasies" suggested by children. They starred a medley of cartoon fruit and vegetable characters, including a flatulent broccoli and a windswept parsnip. These posters by astronomer and artist Tyler Nordgren revealed locations where spectators were able to observe the 2017 solar eclipse. Nordgren used bold colours and graphic lettering to advertise each viewpoint. Each poster also provided safety information on how to watch the event safely.